Hose is compounded to meet the needs of today's gasoline. Designed to be used above the deck. Bulk P..
Silverado 4000 fuel line is constructed with a non-permeable THV barrier layer, polyester reinforcem..
Universal fuel line. Minimum order quantity 50'. 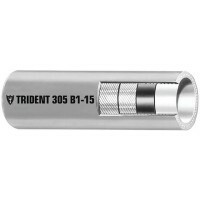 ID: 1/4"OD: 3/8"Length: 50'..
Universal fuel line. Minimum order quantity 50'. ID: 1/8"OD: 1/4"Length: 50'..
Universal fuel line. Minimum order quantity 50'. ID: 3/16"OD: 5/16"Length: 50'.. Barrier lined B1-15 Fuel Hose for both gasoline (including ethanol blends up to E85) and diesel (inc..